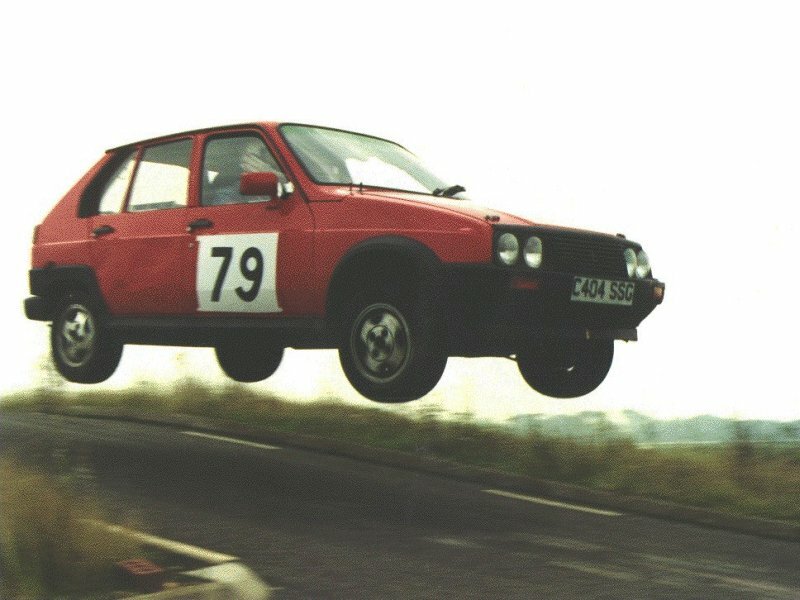 Tomsports historic website click here to see the history of Tomsport, see results, rally cars, read write ups of rallys, events and adventures and meet the people !!! Latest News! Streetly Motor Club Fun Family Friendly Car Treasure Hunt around Merevale Estate. Thank you to all who helped and took part on this very successful event. 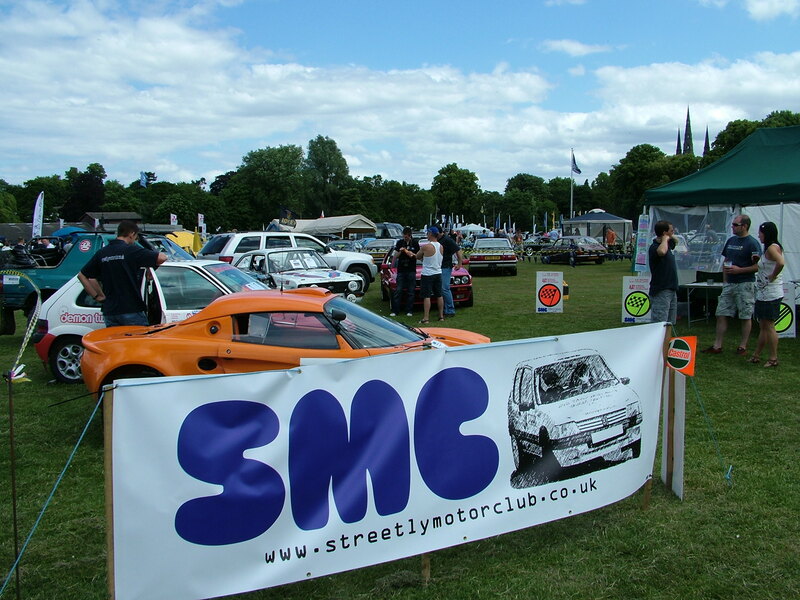 Summer Streetly Motor Club were pleased to be invited to attend Lichfield Cars in the Park a car show in aid of charity in Beacon Park, Lichfield, Staffs.This year was in aid of Midlands Air Ambulance. 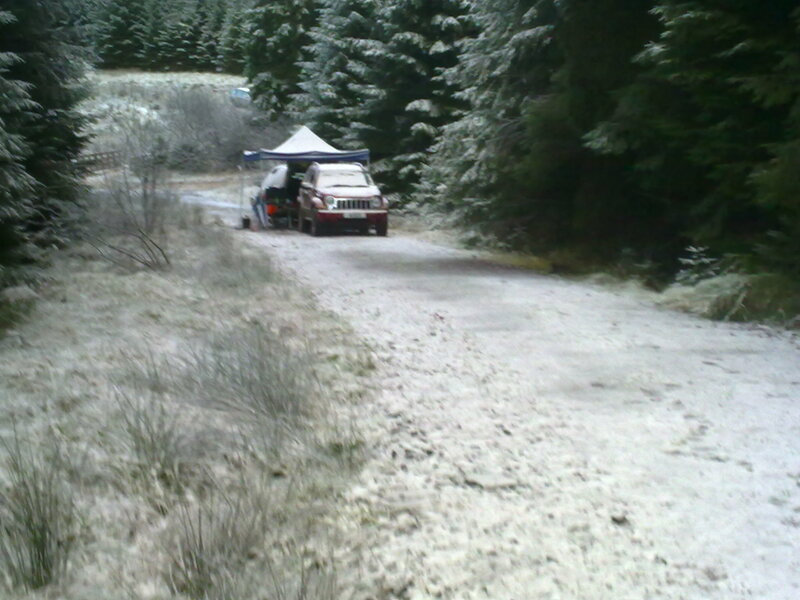 Winter .. Tomsport, friends and colleagues from Streetly Motor Club have been away helping run the annual Roger Albert Clark rally in North Yorkshire, Northumberland and Southern Scotland and as usual it managed to snow !! 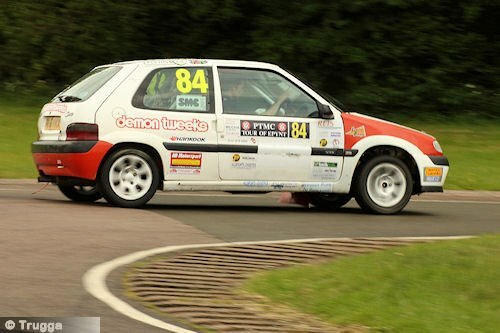 25th September Tomsport are back from round 8 of the 2011 REIS MSA Asphalt Championship EDP Photo News & Bob Dowen Rally Services Patriot Stages at Caerwent army base in South Wales.. .. Despite poor weather, dangerous kerbstones and some difficulty using our spare gearbox, George and David went for an undramatic finish, 64th overall, getting maximum 15 points in the N2 class. This means that with one round still to go, Tomsport have won the FIA N2 class in the country's premier tarmac rally championship!!! Aug 2011 .. 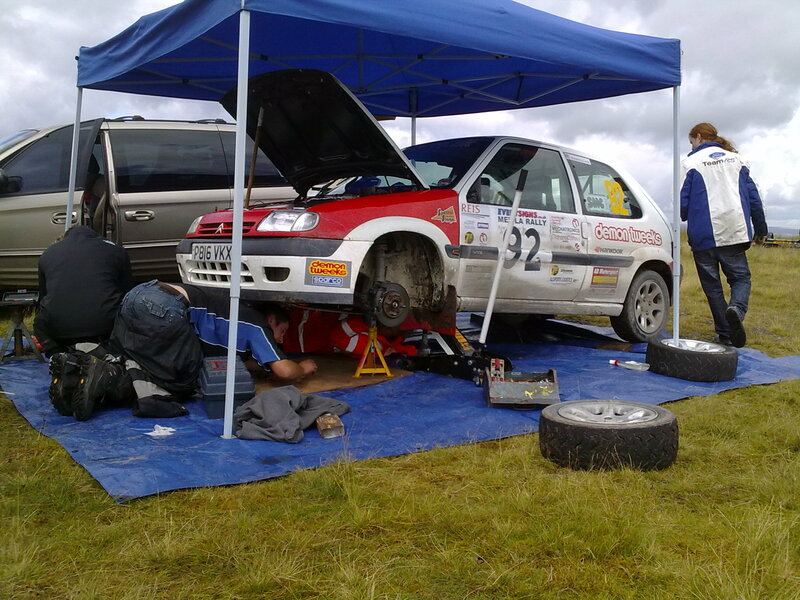 The team are back from a very wet and eventful August Bank holiday on Brecon Beacons, round 7 of the 2011 REIS MSA Asphalt Championship. 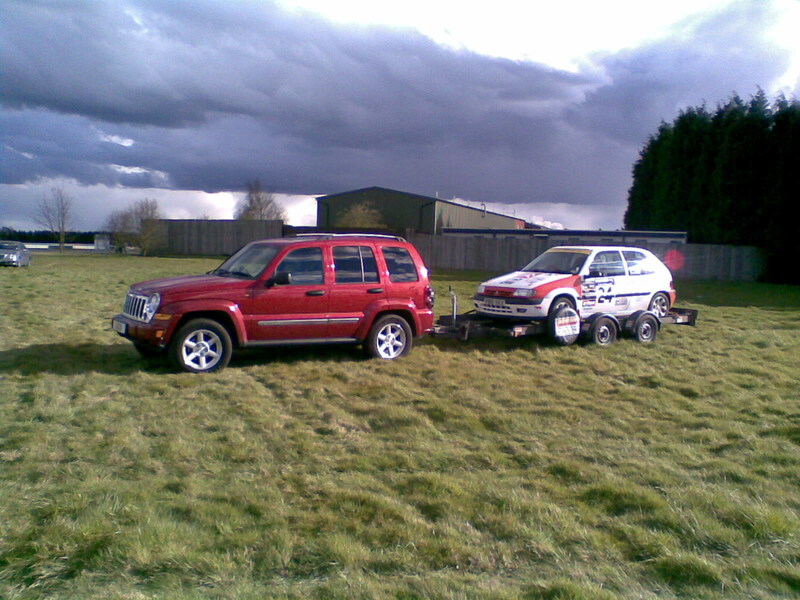 The Eventsigns Mewla Rally based in Builth Wells. Recce and scrutineering Saturday 27th August and 200 miles of rallying over very very fast closed military roads on Sunday 28th August. 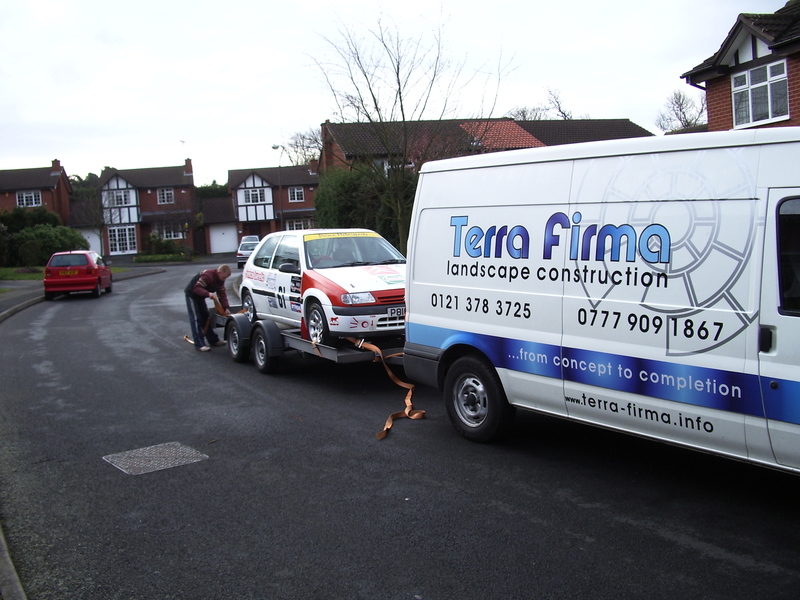 being let down at last minute by both service crew and transit van to service out of. Terrible changeable weather one moment we could not see the roads for falling rain and next blinding sunshine. A failing gearbox meant no 2nd gear from lunchtime meaning very slow driving out of hairpins and around any chicanes, some of which were very tight this year !!! Then the gearlinkage started to fall to pieces so very vague at getting but just possible to get the remaining gears. Driver got 'carried away' in front of TV cameras and large crowd and threw car into ditch for 3 minutes requiring 10+ spectators and rope attached to saxo rear tow hook to get back on !!! Big thank you to Rich, Lawrence, Steve and Jimi, who at short notice, volunteered to come and help, got very wet and worked all services to keep the car going. 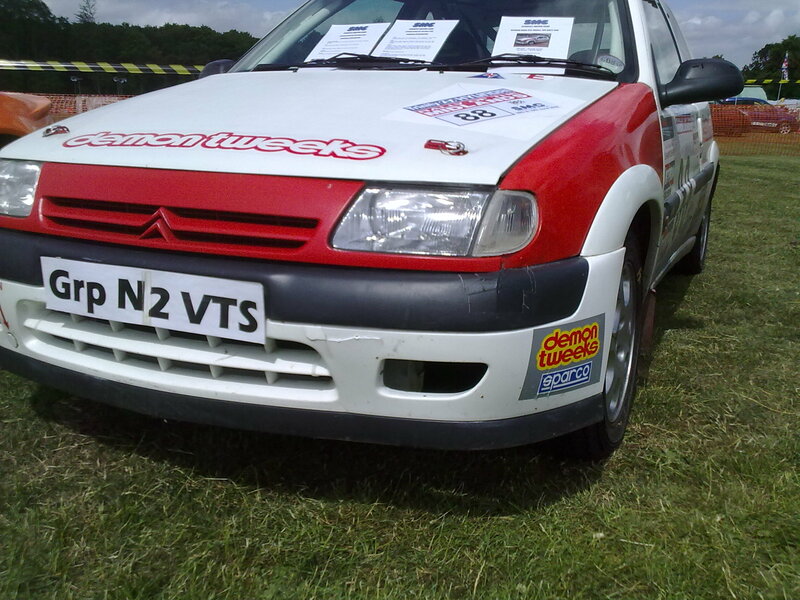 We successfully finished to get 15 championship points, and first in N2, beating a Suzuki Swift and Citroen C2 in our class. June 2011 .. We are back from latest round of the 2011 REIS MSA Asphalt Championship the Streetly Motor Club run 2011 Trinity Hyundai / Roger Clark Motorsport .. Rally of the Midlands, Friday 17th and Saturday 18th June. It was an incredibly hard event due to long miles, limited servicing and poor weather, but we finished 37th out of 92 overall and second N2. Unfortunately a large number of competitors failed to finish only 42 finished out of 92 starters. 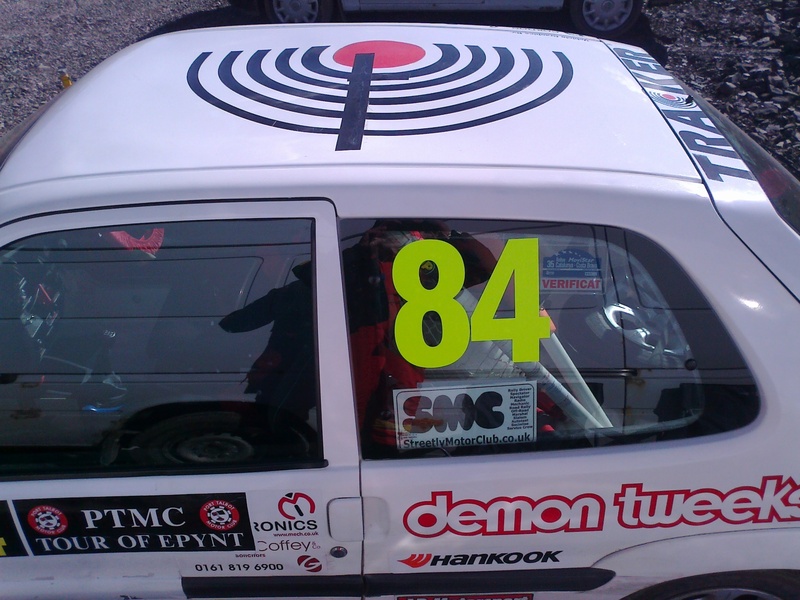 March 2011 we are back from the first round of the REIS MSA Asphalt Championship which is the Tour of Epynt with a couple of awards and some championship points!! Based at Brecon weekend 12th & 13th March with 170 miles including 80 high speed tarmac miles over closed military roads of the Brecon Beacons. 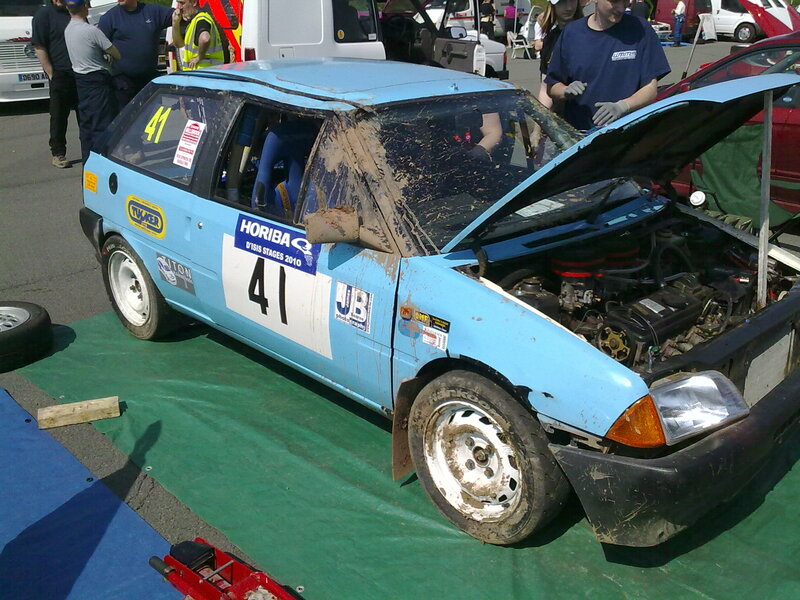 With over 40 cars breaking down ; crashing or hitting sheep and despite some over enthusiasm in front of large crowds and TV cameras we went for a finish and were 60th overall and 1st in N2. Even the weather smiled on us as it was warm and nice for the time of year! Huge thank you to Trevor & Steve for giving up their weekend to help out, Nick & Kev who came down early on Sunday to service and to Paul of Courier Link UK for use of the van. New Rallying Season / New Championship Attempt and New Navigator !!! George and the team welcome David Millard to the left hand 'hot' seat. 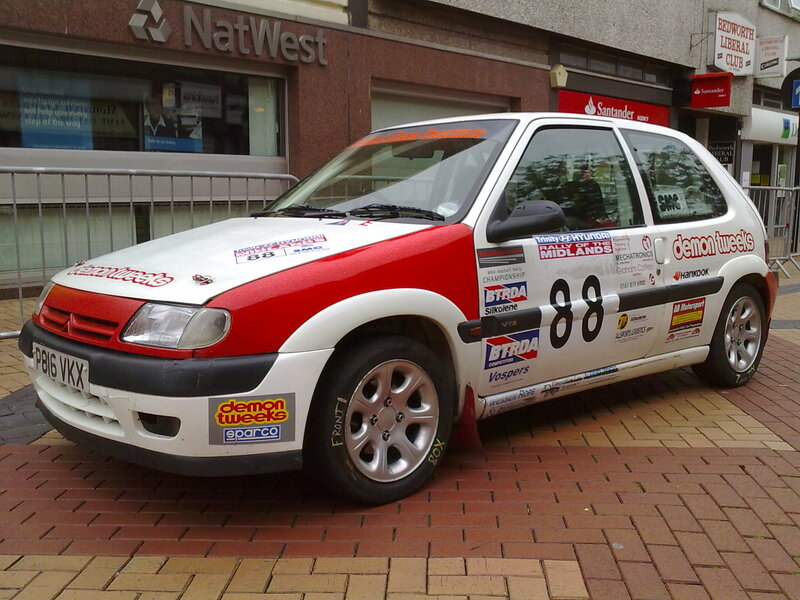 David is a Birmingham based rally navigator who said ..... “looking forward to joining up with the new team, tackling the Asphalt Championship for the first time. Hopefully we can obtain some good results throughout the year, as well as gaining valuable experience of different venues, particularly Epynt and IOM” .... More from David soon !! 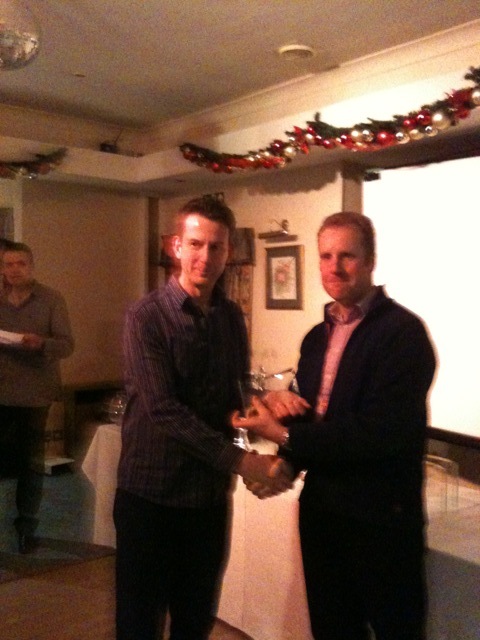 January 2011 George is presented with an award for his 2010 rallying season by WRC Subaru World Champion Navigator and winner of 2003 WRC Phil Mills at Heart of England Award Ceremony!!!! 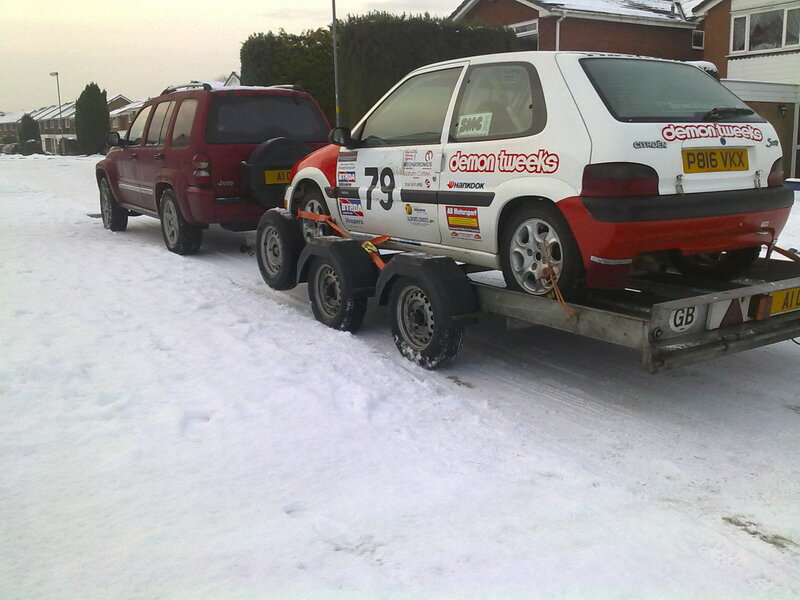 December 2010 Tomsport are back from the final rally of the year at Corby. This was a two day event at Rockingham Speedway, but the weather was so bad is was difficult to even travel to the venue. 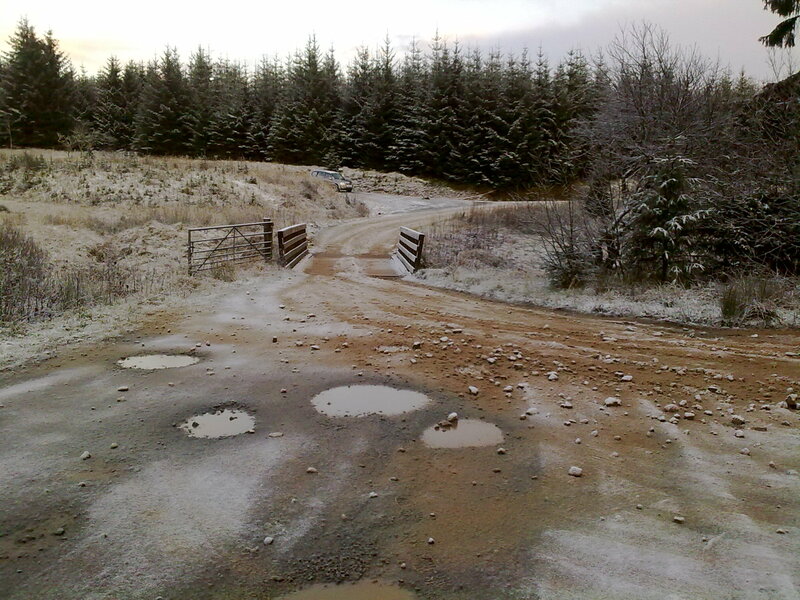 November 2010 Tomsport, friends and colleagues from Streetly Motor Club have been away helping run the annual Roger Albert Clark rally in North Yorkshire, Northumberland and Southern Scotland at a time of considerable ice, snow and freezing weather -9C. July 2010 Streetly Motor Club were pleased to be invited to attend Lichfield Cars in the Park a car show in aid of charity in Beacon Park, Lichfield, Staffs. 18 - 19th June 2010 The team have returned from the next round of the Richard Egger Insurance National Asphalt rally championship the Trinity Hyundai rally of the Midlands, run by my motor club Streetly Motor Club, this two day event runs Friday 18th and Saturday 19th of June covers over 90 stage miles over 7 different venues across central England and with a ceremonial town centre start recreates the feeling of the Lombard RAC rallys of old. Unfortunately despite a good showing on Friday the team had to retire on Saturday morning due to navigator's ill health, so no championship points …..! 29th May 2010 Afternoon of Fun had by all. 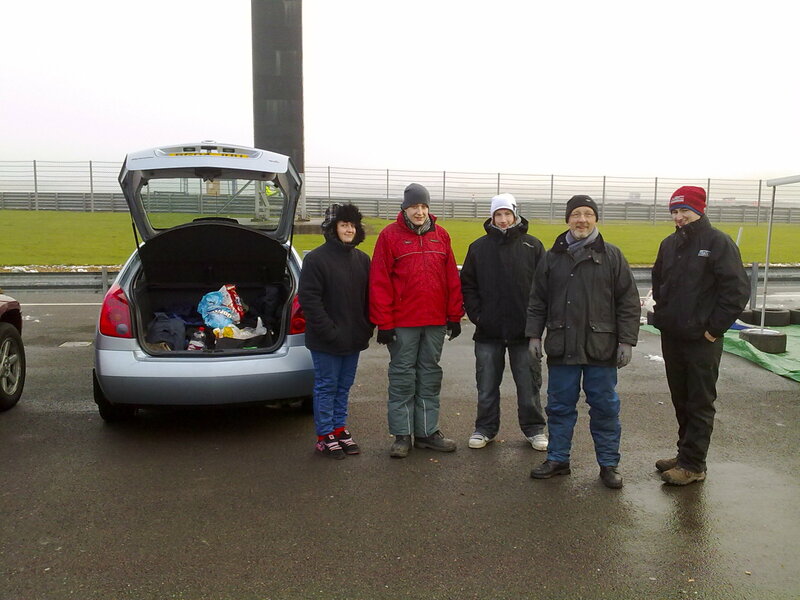 Lots of fun had at Curborough over the weekend. 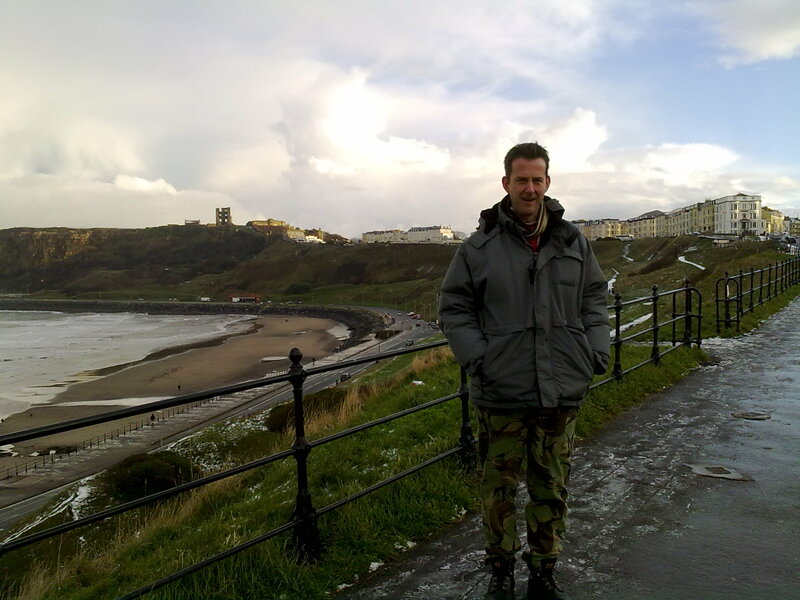 despite the poor weather it was a cracking day. Lawrence has uploaded some video to youtube and Dan has uploaded some photos as well. 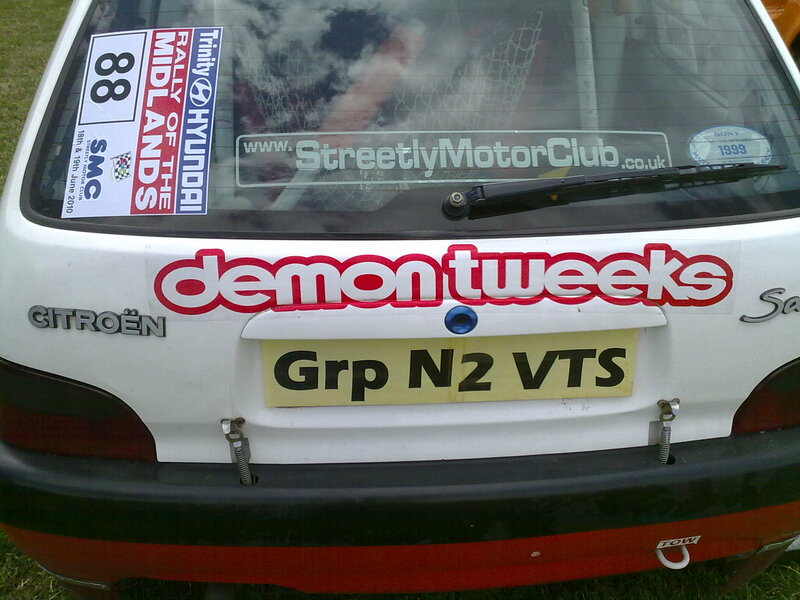 17th April 2010 the team are successfully back from Quinton Motor Clubs Disis stages at Motor Industry Research test track near Nuneaton. Not a championship round but a smooth tarmac, local, single day rally, a chance for Charlie to navigate and team to practice servicing car on events. Despite very hot day and a few tyre and cone incidents we finished 44 O/A. 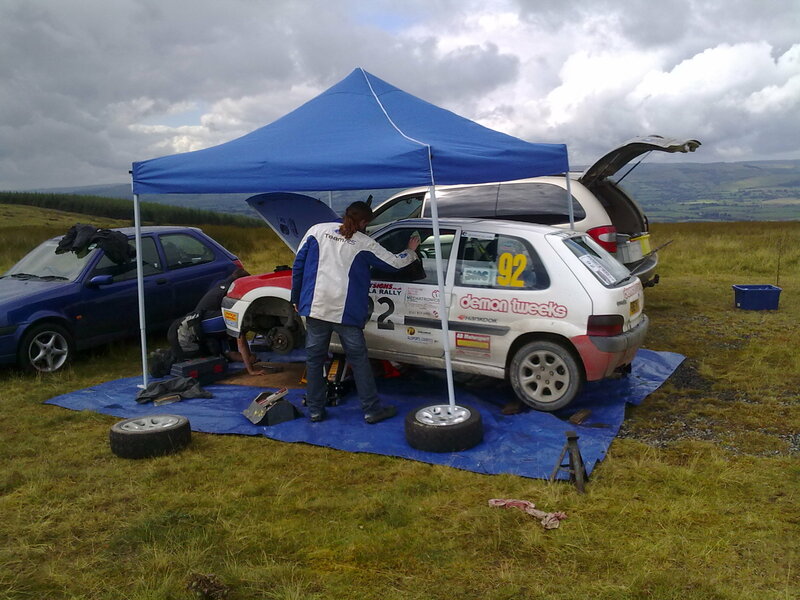 Well done to 2 Dans for a class win and commiseration to our neighbours in their AX who rolled on stage 3. 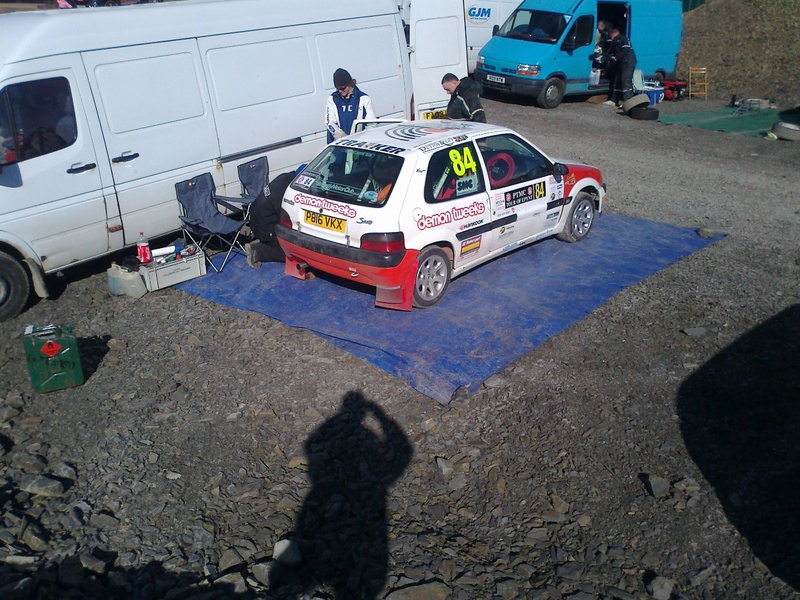 March 2010 George, Geoff and the team are back from the first round of the Richard Egger Insurance National Asphalt championship - the Fix Auto Swansea Tour of Epynt. Starting in Llandovery this is a high speed event over the famous Epynt ranges, despite a broken engine mounting all day and and very limited servicing time, the team managed to finish the final sixth stage 49th overall and 1st in N2 and return to Llandovery, but due to an administration problem there was no award and no championship points for the team. A great disapointment after so much work. Thank you to Frances, husband and dog for braving terrible weather on Epynt to support us and for pictures. Saturday & Sunday 30th August 2009 The team are back from a very wet and very eventful 2009 Eventsigns Mewla rally with another pair of awards for the sideboard! 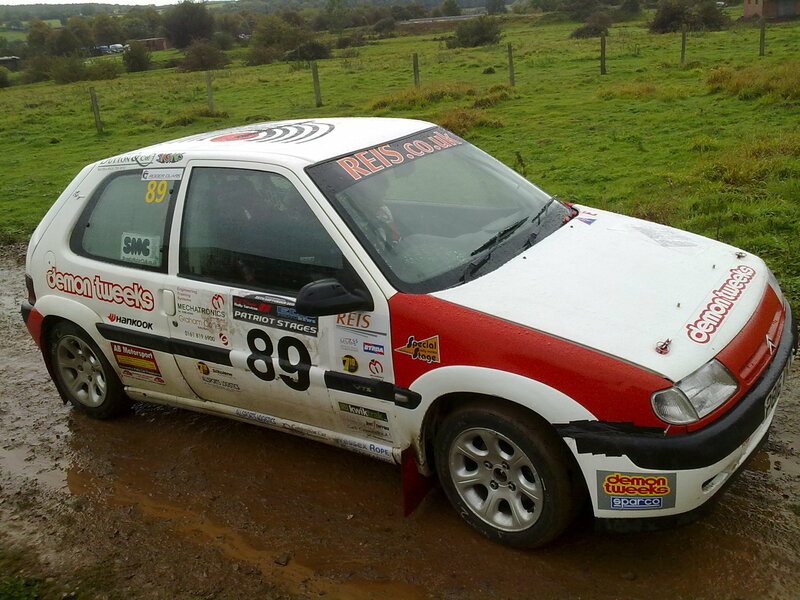 Despite terrible weather the team managed to finish 65 out of 120 and 1st in class N2! 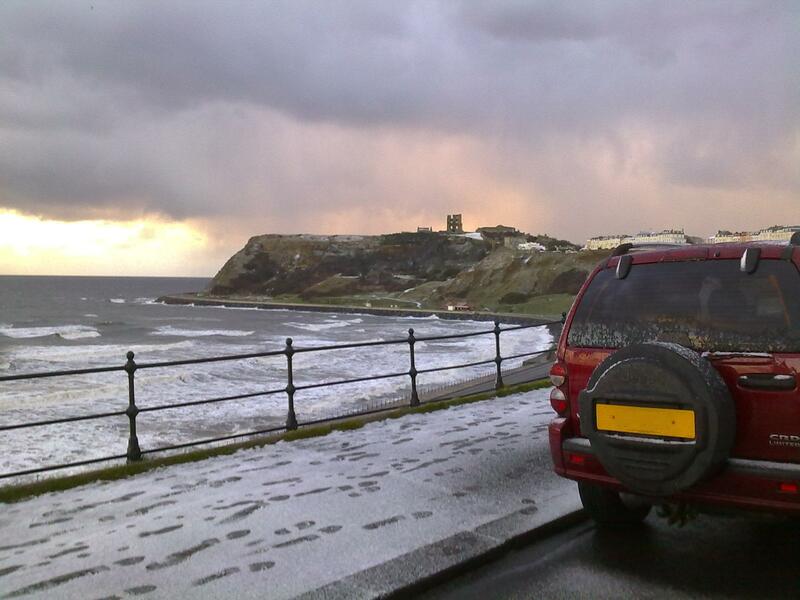 Thank you to Cal for use of his car and Cal, Sandy & Sean for servicing in terrible weather. Well done to the other Streetly finishers. Saturday 11th July 2009 George, Charlie and the team are back from a successful rally at the David Appleby Engineering Azimghur Stages. This 80 + mile tarmac single venue near Chippenham was a first time for the team and despite limited servicing by Jeep, rain, rain, rain and more rain went for and achieved a steady finish. 2009 Season is here and a search for a new navigator. Due to work and other commitments Sandy is leaving the left hand seat so a vacancy exists ! 25th May 2008 At last the team have started its championship bid and despite terrible weather, an all day engine missfire and a couple of navigational problems George and Sandy (car 89), with Cals help, finished the Tamdown 2008 Millbrook National Rally, round three of the Richard Egger Insurance BTRDA Asphalt Rally Series 26th o/a and 3rd in class. 8th April 2008 at the last minute Sandy and George have an entry, after being third reserve, to compete at Quinton Motor Clubs Horiba D'ISIS Stages at MIRA on Saturday 12th April !!! Despite no service crew (on a stag weekend), a complete failure of the car to start throughout the day, new brakes that were too good! and limited service facilities they finished a creditable 47 out of 75 and 12 out of 23 in class....more info to follow !!!!! April 2008 Due to too few entries the first round for the team, the famous Tour of Cornwall, an event where the Saxo has proved very successful has been cancelled. Links to some other websites. 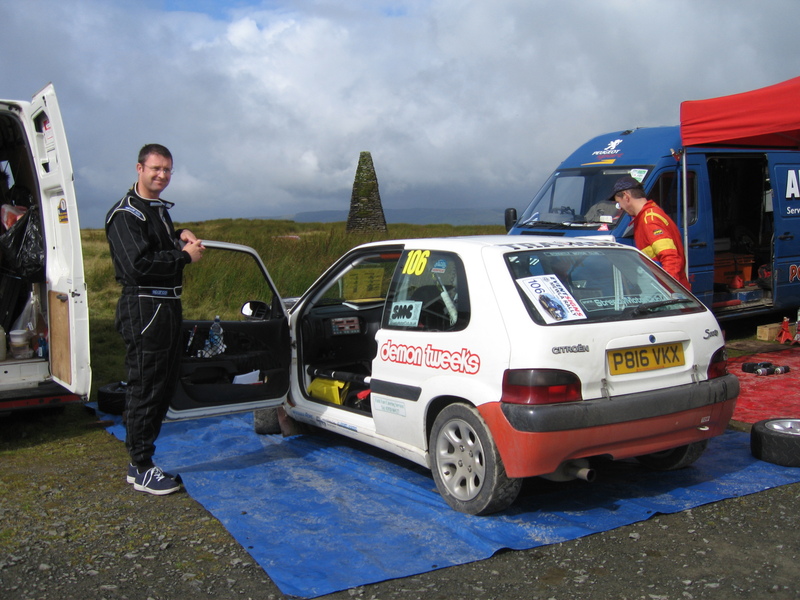 Tomsport returned from a great weekend on the Eventsigns 2007 Mewla National rally over the Epynt Military ranges in Central Wales on Saturday 25th and Sunday 26th August 2007. Fantastic multi venue tarmac rallying over these famous stages, missed the three suicidal sheep and even good weather for a Bank Holiday! 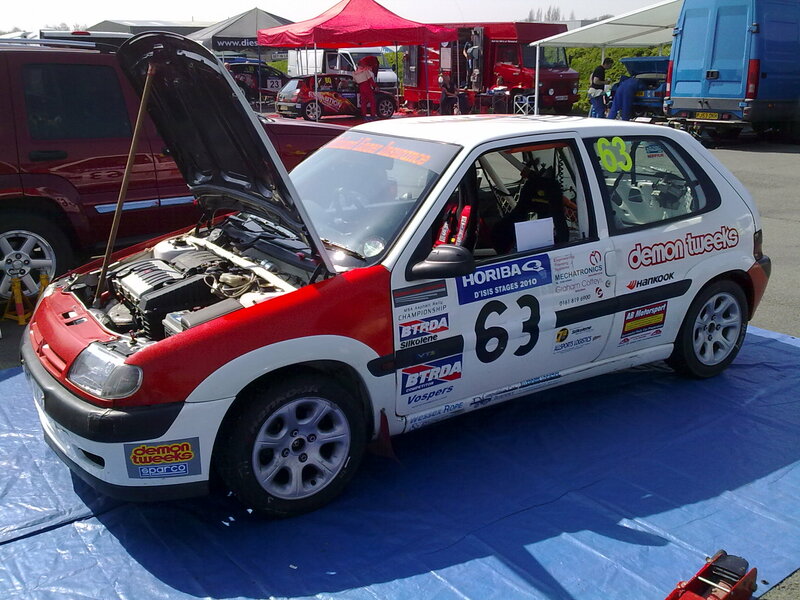 From a start number of 90 the team finished 54 overall and 1st in class N2. In the UKs premier tarmac rally championship and what is very long and hard tarmac rallies spread from Cornwall to Northumberland lots of competitors fell by the ways side but we finished and at the end of a difficult year Paul won N2 Co driver and George was second in N2 driver! 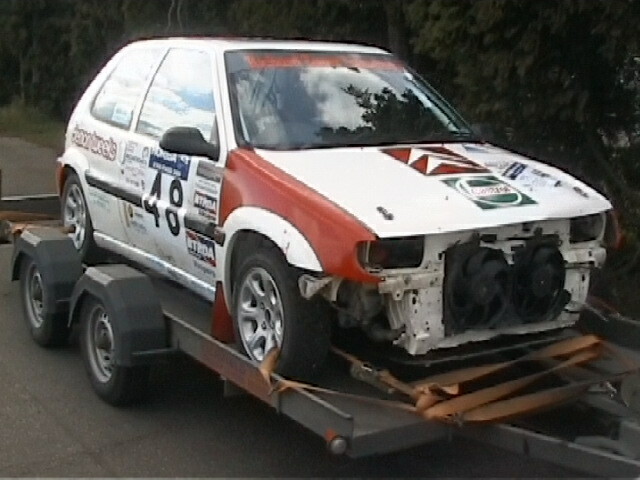 not bad for a first year in the 2006 Prima Motorsport National Asphalt Rally Championship. What success awaits them next? " 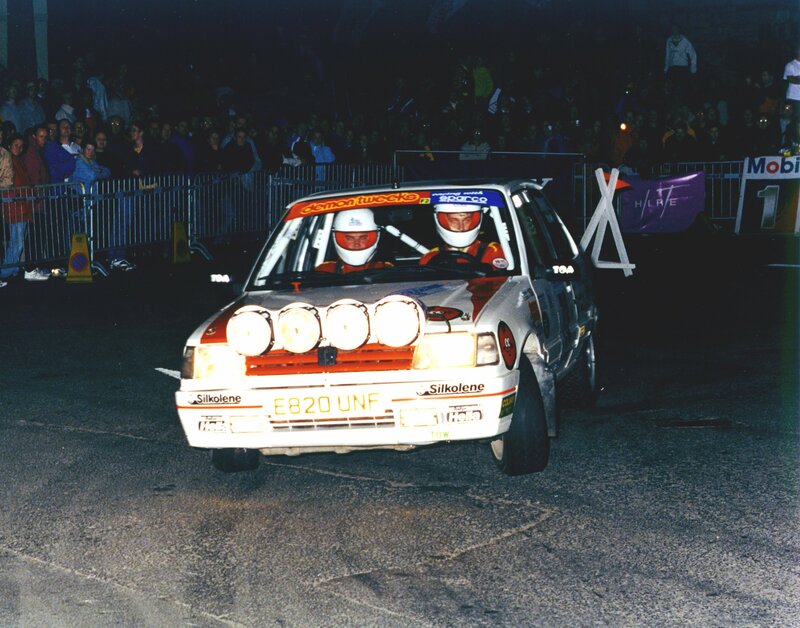 George and Stu gain a finish at the Rockingham raceway event. 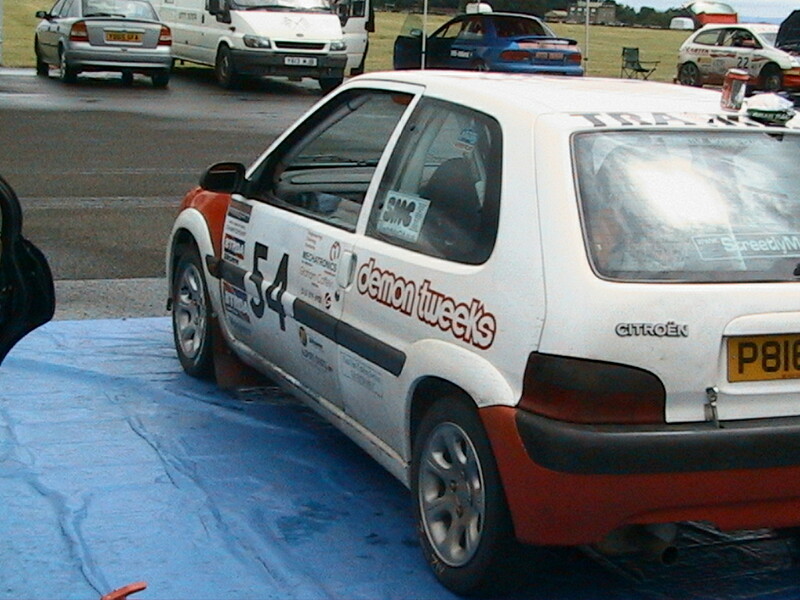 "I have been working on the Tomsport Saxo VTS over the months since we used it as course car on 2004 Streetly Motor Club's Rally of the Midlands, updating the specification to return it to the proper Grp N specification I intend to use in the future but it was still on forest suspension, not really a wise move for a high speed tarmac venue."